I kid you not. This was a little promo that was sitting at the front desk of a place where we ate last night. 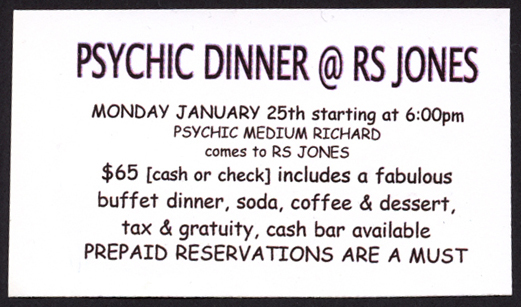 Don’t you sort of want to go to the Psychic Dinner? When you sit down at the table do they already know what you want to eat? We were told by our waitress that the readings were ‘public’ and that there was no guarantee that everyone would get a reading. Well that sounds inviting. “Mr. Jones, your wife is going to leave you for your best friend and you will lose your house in the next year. Oh yeh, and your dog will get hit by a car.” What the hell is poor Mr. Jones to do with that info in front of a $65 dollar a head fabulous buffet dinner crowd (with soda, coffee and dessert)? Seems these dinners are rather popular as the waitress also told us that she thought is was sold out. On a Monday night! I particularly like the fact that the psychic only has a first name. Anyone interested in signing up for next month with me? What if what she tells me made me lose my appetite? ?